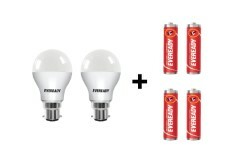 Amazon India is Selling Eveready B22 Base 9-Watt LED Bulb (Pack of 2, Cool Day Light) with Free 4 1015 AA carbon zinc batteries Rs 169 Best and lowest price online.Free Shipping for Prime Users. Activate your prime account trial for 60 Days.You can follow the below steps to buy this product at their deal price.Keep Visiting dealsheaven.in for more Best offers ,hot online deals, promo code, coupons and discount . How to buy Eveready B22 Base 9-Watt LED Bulb (Pack of 2, Cool Day Light) with Free 4 1015 AA carbon zinc batteries ?